This was the long-range summer pelagic trip conducted by Island Packers, as organized by Ventura-county birder Dave Pereksta. We started from Ventura Harbor at 7 a.m., visited Anacapa Island, then motored west along the south sides of Anacapa and Santa Cruz. Once we reached the northwest corner of the Santa Cruz Basin (an area of very deep water south of the island) we headed south along the underwater escarpment that marks the basin’s western edge. Areas like that tend to be characterized by upwellings that bring nutrient-rich water to the surface, leading to more fish, marine mammals, and birds. We went south as far as a point about 7 or 8 miles north of San Nicolas Island, then turned east and headed to Santa Barbara Island. From there we made the final trip back north to Ventura, passing east of Anacapa. The whole trip took about 12 hours. About half of it was in Ventura County waters, so those birds didn’t count toward my Santa Barbara list; the other half was in Santa Barbara County. Is it interesting to a non-county-list-obsessed person how the offshore county boundaries are drawn for bird-watching purposes? 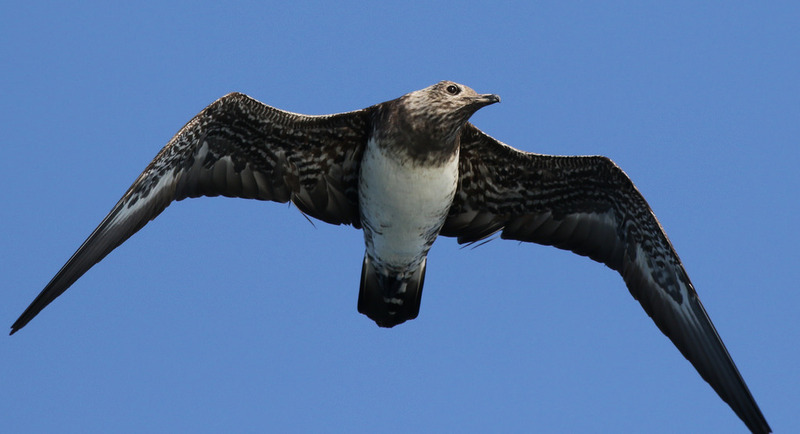 Probably not; apologies… But basically, county boundaries don’t actually exist far out in the ocean, so birdwatchers have come up with a system of assigning pelagic birding “counties” based on whatever the closest point of land is. This makes for an interesting patchwork off southern California, since some islands (Anacapa and San Nicolas) are in Ventura County, while others (Santa Cruz, Santa Rosa, and Santa Barbara) are in Santa Barbara County. Fortunately, keeping track of all that was up to the trip leaders: Super-experienced birders who got a free ride (I assume) in return for acting as guides for the paying customers, keeping the county-specific eBird lists and helping find and identify birds. Enough meta; on with the birds! We saw thousands of Sooty Shearwaters during the trip, but I’d already managed to add those to the list by scoping from shore at Ocean Beach Park west of Lompoc. 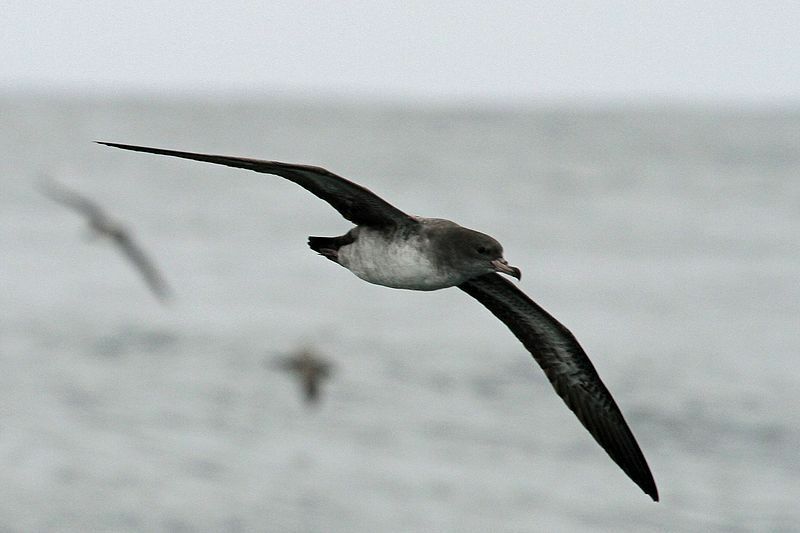 The Pink-footed Shearwaters were another story, though. We saw lots of them mixed in with the Sooties, and I soon got familiar with their slightly slower flight style. We saw a few of these at various points during the trip, skittering away from the boat across the water. I’m pretty sure at least one group was in Santa Barbara County waters, though I won’t know for sure until the official trip lists are shared with participants. Such a cool bird! They breed in New Zealand, but during the Northern Hemisphere summer they range up into the eastern part of the North Pacific. Our trip leaders weren’t expecting to see them since we weren’t going to be far enough offshore, but surprise! We saw a lot of them in both counties; close to 100 in the final count. I loved getting to know their graceful, arcing flight pattern, the way they swoop down toward the water and up again, similar to but distinctly different from the shearwaters they were hanging out with. 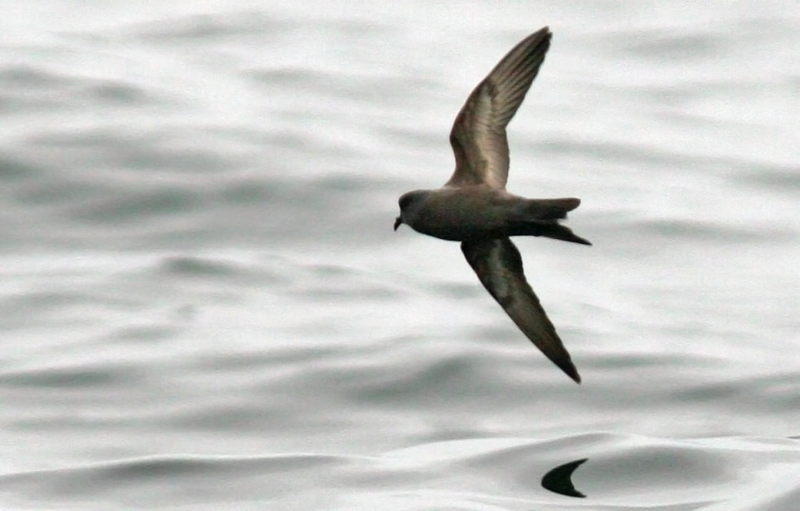 I’d never identified a storm-petrel before. 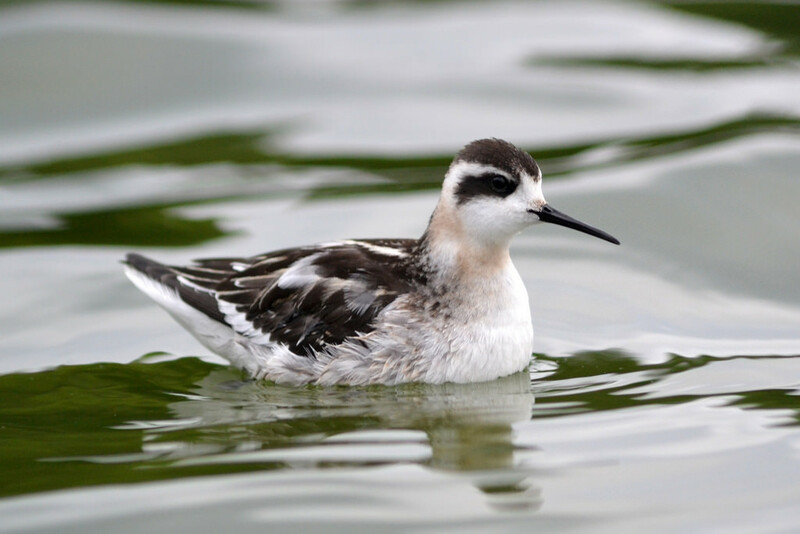 I’m sure I must have seen them, having spent so much time sailing off southern California growing up, but almost all of that time I was racing, not birdwatching, and I guess I just kept the two activities compartmentalized. Anyway, I’ve now enjoyed quality views of a whole bunch of Black Storm-Petrels; we saw lots of them throughout much the trip. I was grateful to have expert birders around to help me learn these. Peter Gaede (who led our Big Pine Mountain survey trip) patiently showed me how the Black Storm-Petrels had deeper wingbeats, while the slightly smaller Ashies had quicker, shallower wingbeats. The difference was subtle, but with someone standing next to me to confirm the IDs it didn’t take long to be able to pick them out. 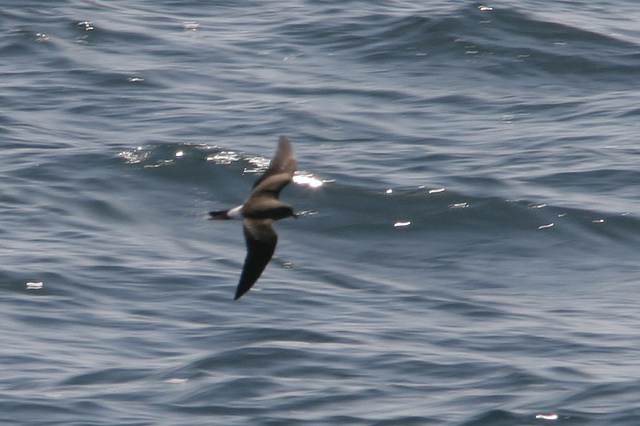 Again, I was lucky to have experts around to find and point out the different storm-petrels in the big groups we motored through; I saw a few of these at various points. Some of the more-expert birders on the boat saw a few additional storm-petrel species, but I wasn’t able to get on any of those. This is the bird (actually birds) that the trip leaders were most excited about. It’s a super-rarity that normally lives in the Galapagos Islands, but a few have showed up in Southern California in recent years. We saw one perched on Arch Rock on the east end of Anacapa; that one was something like the 3rd or 4th county record for Ventura County. Which was cool and all, but I couldn’t help feeling a twinge of regret that the bird hadn’t been a few miles away in Santa Barbara County. 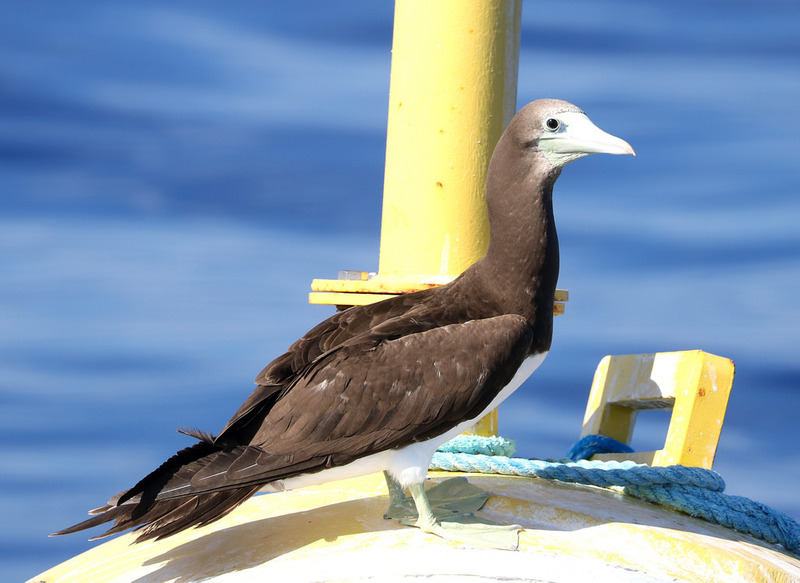 Fast-forward to late afternoon, though, as we were approaching Santa Barbara Island, when a second Nazca Booby appeared out of nowhere and flew right over the boat as dozens of giant lenses tracked it and snapped photos. Apparently that one was only the second Santa Barbara County record; it was a real privilege to be there for it. 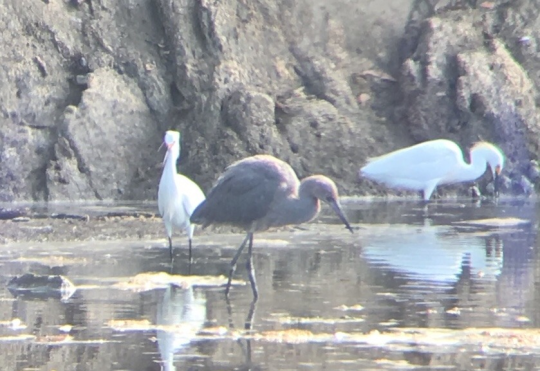 Officially the sighting will have to be approved by the California Bird Records Committee, but for my low-grade just-for-funsies county year list it definitely qualifies for now. Another tropical species that has been expanding its range. 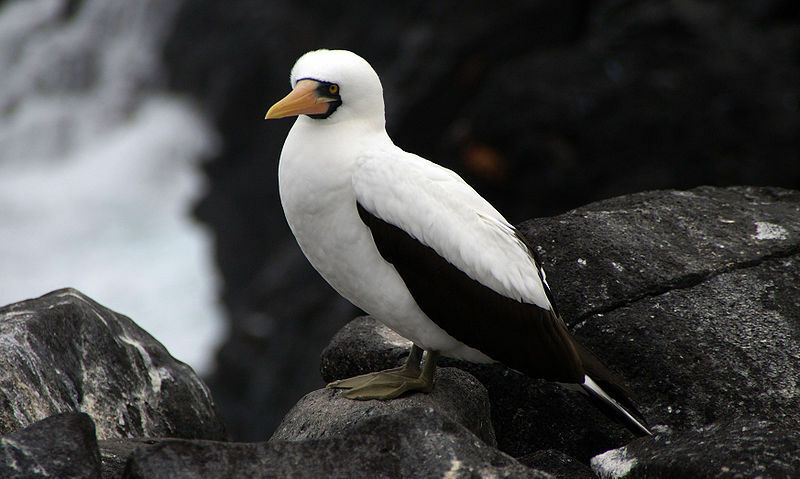 I didn’t realize it before the trip, but last November Brown Boobies were discovered nesting on Sutil Island, a small islet a few hundred yards from Santa Barbara Island. We counted more than 40 of them perched on the rocky cliff as we bobbed a few boat lengths from shore. 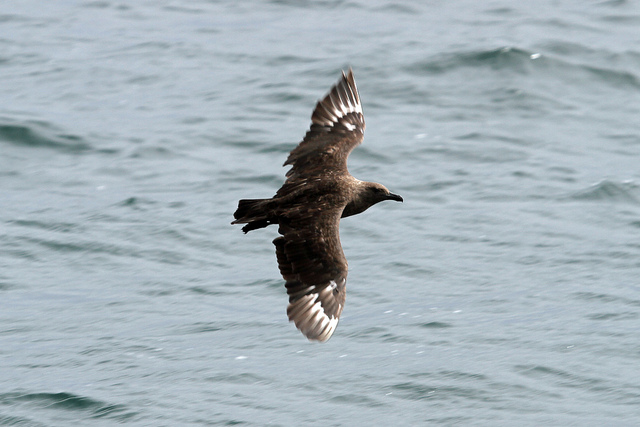 We saw a few of these near Santa Barbara Island; not the adult form with the long central tail plume that gives it its name, but younger birds like this one. I’ve got a soft spot for jaegers, and seeing these (we saw several) was really special. This one showed up to check out the chum line that professional bird guide Wes Fritz was ladling out from the stern as we cruised north of San Nicolas Island. One of the goals of the trip was to look for American Oystercatchers on the south shore of Anacapa, where they sometimes show up mingled with the local Black Oystercatchers. And… one was there! 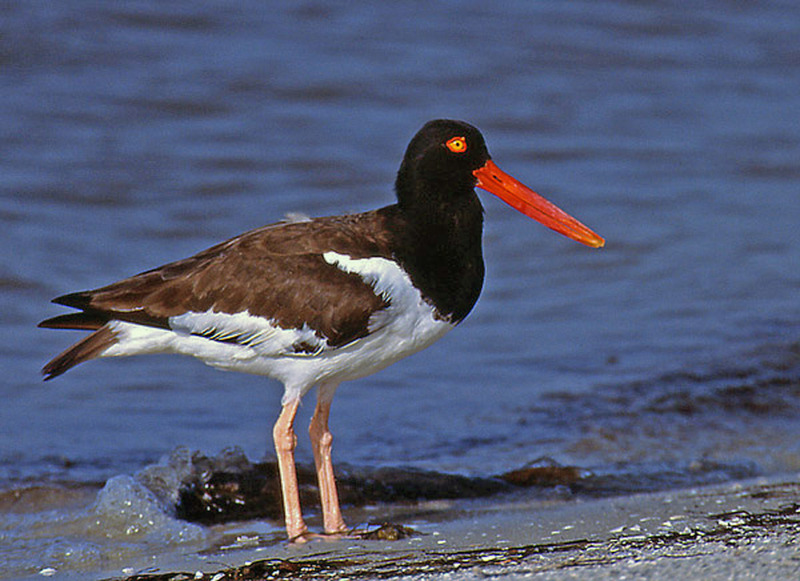 It’s not for-sure; hybrid American/Black Oystercatchers also tend to show up in Southern California, and there’s a complex formula called the “Jehl scale” that birders sometimes use to try to figure out how “pure” a particular American-ish SoCal oystercatcher is. I dunno; we got good looks and lots of photos of this one, and the assembled experts seemed to think the bird looked pretty good for American. This one was a legitimate thrill for me; a bird I’d very much hoped we’d see, that I knew was a possibility but that was also far from a sure thing. It’s a pelagic gull that’s rarely seen from shore, and I was so happy to see it I didn’t even mind that it was in Ventura County. And that’s it! On the way back the experts on the boat were fairly giddy; “one of the top 5 Southern California pelagic trips ever!” one said. I’ll take his word for it; it was only my second pelagic birding trip, so I don’t have much to compare it to. But I sure had a good time. 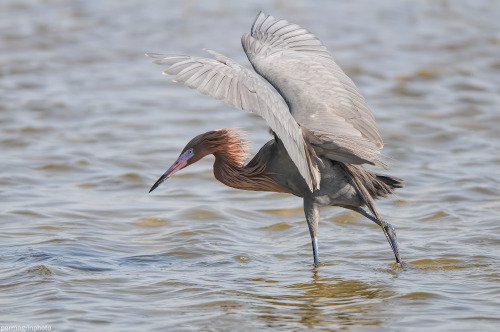 Local SB birder Glenn, who’s 2015 green big year was a source of inspiration to me in working on my own non-green county list this year, sent a message this morning that he was seeing an adult Reddish Egret in Goleta. 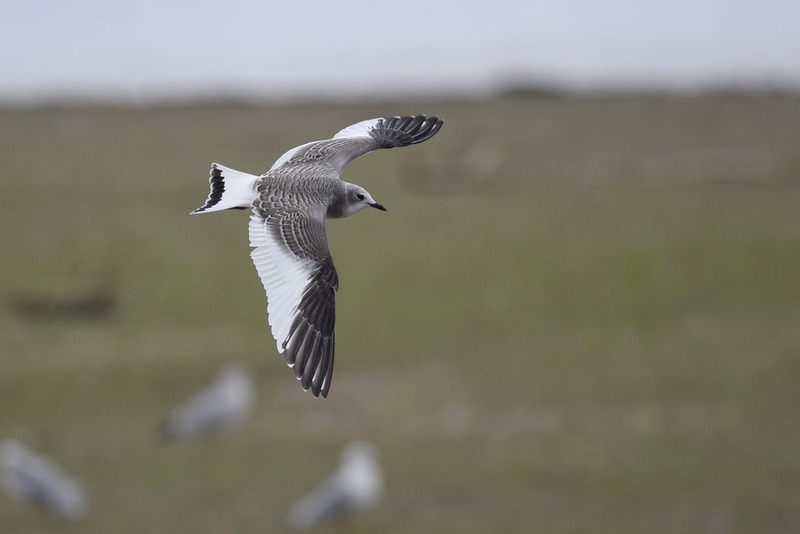 This turns out to probably be the same bird Nick (who was on the Big Pine Mountain survey trip last month) had recently seen up the coast at Ocean Beach County Park near Lompoc. You are currently browsing the Carp Without Cars blog archives for July, 2018.